Fresh off the success of her movie Raazi and now shooting for her upcoming movie Kalank, Alia Bhatt has a lot going on for her. Of course, we haven't forgotten the rumours of her dating Ranbir Kapoor but we are still processing that one. And through all this, Alia still finds time for things like an outing with Ranbir and family, chilling with friends. Oh, and more than enough time to give us some serious style goals. But really, what else is new? From the girl who Sonam Kapoor on Koffee With Karan once said should "dress her age" to one who can wear anything and rock it, Alia Bhatt has come a long way when it comes to style and fashion. But if there is one style that the actress has completely made her own, it's when Alia goes Indian. Let's take a moment and talk about how beautiful she looks everytime she decides to go the ethnic way. Recently she posed in a beautiful Tarun Tahiliani suit that caried summer motifs and tones all over. Styled by Ami Patel, Alia looked statuesque in the printed suit, paired with jhumkas and minimal make up. Alia wears a whole host of clothes, from dresses to co-ord sets, to skirts and shirts, and she pulls off chic every time. But when Alia wears ethnic, Indian wear, she reeks of a certain innate quintessential beauty and charm. It brings out her features like nothing else does. Here's when she wore a Sabyasachi creation at Sonam Kapoor's reception and looked so resplendent. 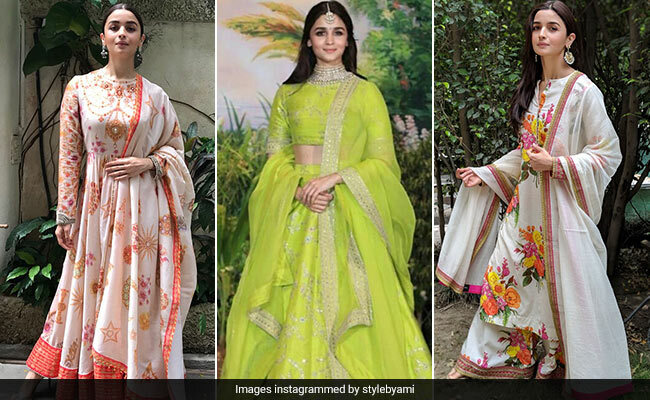 The lemon green lehenga with silver embroidery, paired with a choker and a maangteeka made Alia one of the best dressed people there. Another time she stole hearts was when she stole some summer vibes by wearing this floral printed suit, another Sabyasachi. Reminiscent of her character in Raazi, Alia looks like a Kashmiri beauty, and the floral print only accentuates that. If we go by how every person has a style they can call their own, we think desi might just be Alia's, and we will be very glad if it is. Keep them indo style vibes going Alia!